At ButcherBox, we are committed to delivering the healthiest, highest standard, direct-to-consumer ecosystem of meat procurement and delivery worldwide. We are also compelled by our passion to always innovate, and, if need be to rewrite the rules, to achieve the mission of being the most ethical, sustainable, and beloved purveyor of meat. Part of that innovation involves searching the globe for the best meat for our customers, no matter where in the world it may originate. Recently, we’ve observed one of America’s fast-food franchises making claims in their commercials that geographic proximity is a deciding factor in meat quality. Specifically, they imply that meat from Australia is inferior. The problem is that this tactic ignores one major accepted difference between U.S. and Aussie meat: Beef from Australia is considered to be higher quality and better for you than the majority of meat from America. In fact, Australian beef has a few very clear advantages over homegrown cattle. For one, the vast majority of Australian cattle is grass-fed for its entire lifecycle. In the U.S., only about 2 to 4 percent of cattle is grass-fed and grass finished, as we’ve pointed out before. This difference is due to the advantage Australian farmers have in terms of having massive swaths of land for their cattle to graze and the number of cattle farms that can operate in the country due to climate. Even when cattle are considered grass-fed in this country, very few are actually raised purely on pasture; most are raised on a diet of grass and forage —which is often defined in very broad terms. Language and labelling can also be problematic for U.S. raised beef as meat referred to as being “pasture raised” is oftentimes not what is implied. At ButcherBox, we want to supply the best beef possible. We’ve been to Australia and have been amazed by how vast some of the cattle ranches are. Whether you know it or not, the continent in the South Pacific is more than just surf breaks and Sydney. Most of the country is wide-open space that is more temperate for grass to grow. In the US, our outstanding farmers produce amazing grass-fed beef; however, the number of such purveyors is limited by geography and the availability of grazing lands. Australian farmers don’t have the same limits. Literally, on one of our visits to an Australian farm, when we arrived, the rancher said, “Let’s go find the cows, I’m not sure where they are.” Where they were was roaming in open pastures. 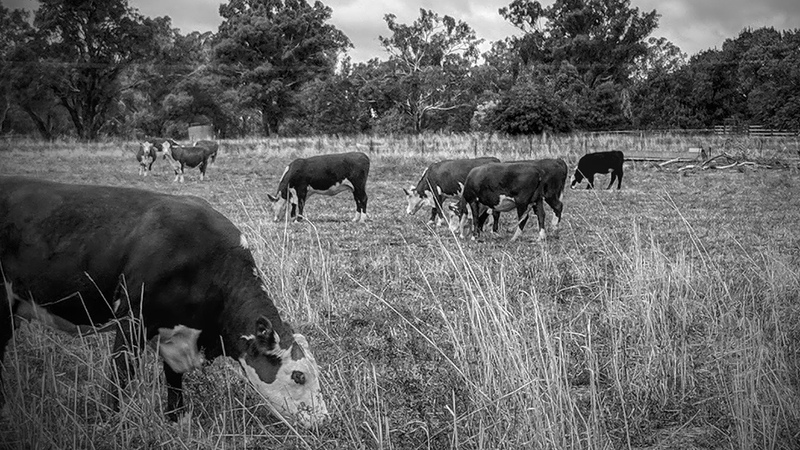 We source some of our beef from Australia because their grassland and the quality of their beef is exceptional. 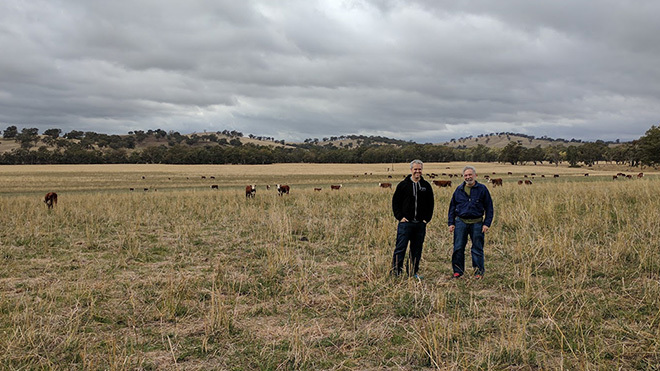 Grass-fed beef in Australia undergoes a stringent grading process factoring in attributes contributing to tenderness and flavor that are not considered in the U.S.
Mike Salguero (CEO) and Michael Billings (Head of Procurement) on a family run farm in Australia. So we offer both US and Australian grass-fed beef because we think both are of the highest quality and meet our benchmark of being free from antibiotics and hormones, and raised with our environment and people’s health in mind. Another difference between U.S. beef and its Australian meat is in the standards each is held to. Our American farmers take it upon themselves to raise their cattle by the standards we deem important. In Australia, there is a wide-reaching system in place to do that. It’s called MSA or Meat Standards Australia. Basically, MSA makes it simpler to buy and cook Australian beef and lamb. Meat certified by the MSA is graded for tenderness, juiciness, and flavor, and is also labeled with recommended cooking methods. No such system exists in the U.S.; in fact, there are a number of grading and certifying agencies that actually make it much more confusing to buy the best quality meat here at home. There’s more to producing quality meat than just making sure it tastes great. At ButcherBox, we strongly maintain that those who raise cattle (or other livestock) should do so in an ethical manner. And the Austrailian meat industry believes this as well. The country has a system in place called the Australian Livestock Processing Industry Animal Welfare Certification System or AAWCS. This is important to our customers as well. We’ve already heard from a few who find the Austrailian standards reassuring that they will be getting certified 100% grass-fed meat from livestock that was raised humanely. If we didn’t believe this was the right thing for our customers, the cattle, and our farmers (here and abroad), we wouldn’t be comfortable delivering our ButcherBox to our customers’ doors. So, while we won’t stop seeking out and bringing our customers the highest-quality meat from farmers across the United States, we also want to make sure our customers have access to the best beef in the world. Whether that comes from Montana or Northern Australia, we strive to deliver the healthiest, most humanely-sourced meat we can find. Stay tuned for more tales of our global travels to find you the best possible meat!